A weekly online test will be uploaded here on our site, including subjects covered in the pharmacology lectures held in the preceding week, to help you in your continuous process of self evaluation. 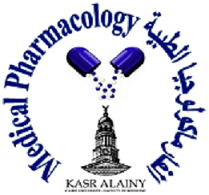 Hope you enjoy the Pharmacology course and achieve your intended learning objectives. A continuous assessment exam for third year medical students will be held weekly on Saturday from 11 am - 1 pm.